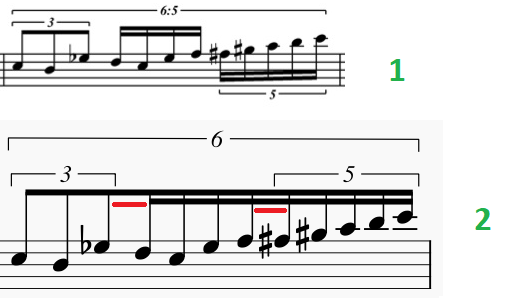 When I created nested tuplets in Musescore, there was always a connected line between notes that I couldn't delete. How can I do to remove them. (Redundant lines are underlined in red in the detached image). Have you tried the Beam Symbols in the Beam Properties section of your workspace? I believe the upper rightmost of those Beam Symbols should do what you desire (as long as you successfully drag that symbol there). See https://musescore.org/en/handbook/beams for more details and for pictures of the Beam Symbols. Not the answer you're looking for? Browse other questions tagged piano composition sheet-music musescore tuplet or ask your own question.